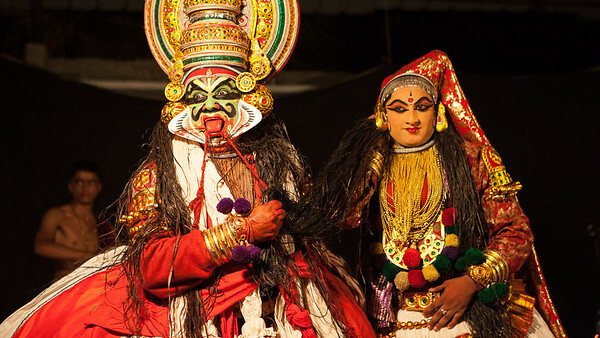 Kathakali is a dance drama that originated in 17th century Kerala, India but its roots go back much further, reaching back to ancient Sanskrit theater. Kathakali is characterized by actors in elaborate face make-up and ornate costumes playing out the old stories of good versus evil with an intricate scheme of hand movements, body movements and facial expressions. Training in the art often lasts 8-10 years, as performers learn the application of make-up and the various hand and facial expressions to tell the many stories.